The State Route 299 runs across the northern part of California, from Arcata to the Nevada state line. The highway is part of the California Freeway and Expressway System and portions of the highway are included in the State Scenic Highway System. Steep mountainous terrain, combined with challenging geotechnical and soil conditions required non-typical methods of construction. The road has been realigned many times in an effort to accommodate the challenging and dangerous grades and curves through the mountains. 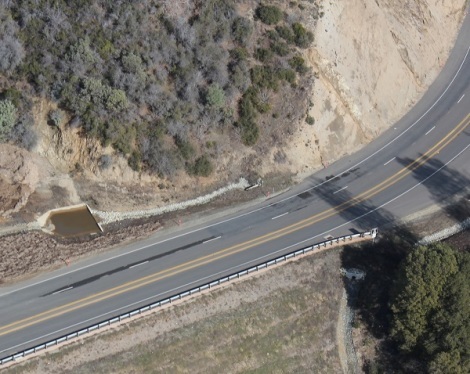 In an effort for highway safety improvement, a project from mile marker 0.3 to 7.1 was initiated, which included, among other works, an erosion control plan to be carried out by using Maccaferri Gabion Mats. Consequently, Gabion Mats were used in lieu of rock-lined ditches to minimize the potential for “ditch shifting” due to erosion and undercutting. It was anticipated that gabion voids would help decrease sediment transport onto waterways and that overtime the gabions will fill with sediment and allow natural vegetation to grow. To complete this work, 1,300,000 cubic yards of soil was excavated from 22 cuts and placed into 8 major fills. To discover more about Maccaferri erosion control products, please contact us.